Way too young, eleven year old Tucker Creed and his six year old neighbor, Sylvie Bissenette, find they have something awful in common. Creed then decides he’s going to do everything in his limited power to shield his Sylvie from her ordeal. So he does and Creed and Sylvie form a bond that grows and blossoms with their ages. They plot to leave their lives behind, the town they live in that will hold them down and the histories they share that, unless they break free, will bury them. Sylvie goes to their special place, Creed never shows and she doesn’t see him again until it’s too late. With Creed gone, Sylvie is forced to endure a nightmare and do the unspeakable to end it. To deal, she develops a hard shell with sharp edges that very few can break through. So when Creed again finds his Sylvie, he discovers the girl he loved is locked away and he has to find his way back into her heart without getting shredded in the process. 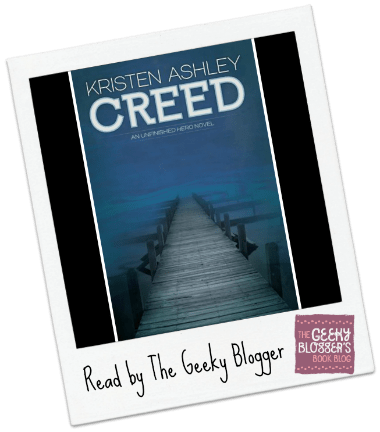 Read It Rate It Thoughts: Creed by Kristen Ashley was super hot and really just a gosh darn good read! Though I was kind of pissed at Creed a good portion of the book (thought Sylvie deserved better), in the end I was glad they got together.